So, this is sort of exciting: esheppy (me) is Mr. Beer's "Brewer of the Month" for November. EricG (Mr. Beer's Señor Brewmaster and BJCP Certified Beer Judge and member of the American Brewer's Guild Alumnus and the moderator of the Mr. Beer discussion forums) wrote in his email to me, "I would personally like to thank you for all you contribute to the forum-- from your solid advice and insightful questions to your great sense of humor and passion for brewing good beer. Of course, it's nice to see that you're almost always trying something new, whether it be using grain or yeast starters! When you share these experiments, it always adds to the conversation... Anyways, the community surely wouldn't be the same without you." When I got to EricG's email, I was shocked. Most of the Brewer's of the Month have been just completely impressive people when it come to their brewing knowledge and what great insights they share on a consistent basis. And, there are several people on the forum who I could think of off the top of my head who I think are more deserving of the honor than I. I do agree with EricG that I ask good questions and my readily apparent addiction to home brewing certainly might indicate a "passion for brewing". I do experiment quite a bit, and usually share these experiences (mostly to get advice from the experts). But, honestly, I did not expect to ever be Brewer of the Month, and certainly not this month. If you are interested in reading the writeup, you can see it by following this link. In other SheppyBrew news: Mr. Beer has recently updated the stats on most of their HME's and UME's. 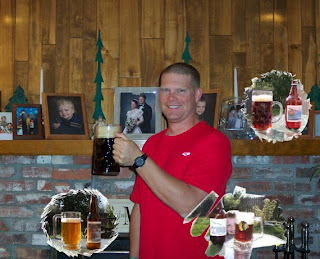 Mr. Beer's Señor Brewmaster actually told me that he had been recalculating for months and one of my posts (one of my insightful questions mentioned above) gave him the motivation to get it all done and updated. The updates for the most part went pretty far in making all my recipes much more balanced than they were before. Of course, it also pushed a couple of my more recent beers (ones I was making a concerted effort on making balanced) toward the hoppy/bitter side, so we will have to see how those turn out. Most notably, my newest version of Dragon Spit is pretty far to the hoppy side of balanced. Of course, it is still in the fermenter, so it will be awhile before I find out what it tastes like. The original version was very malty and needed bitterness, but I might have gone too far. Stay tuned for updates. My Rocktoberfest Ale was a pretty big hit. I finished the last of them while watching game 2 of the world series. I plan to make this one of my seasonal beers and hope to have some on hand every October whether or not the Rockies are in the playoffs. The only changes I think I want for this beer are to make it a bit lighter on the color and get the carbonation up to a respectable level. Not sure exactly what I did wrong, but carbonation on this beer was pretty low and me being one of those American Beer Drinkers, I like my carbonation. I actually tried one of my X-Mas Ales in October. I am well pleased with this beer. This is will be another seasonal regular for SheppyBrew. I think probably based on the taste test, next year I will not have to start brewing the beer so early in the year. I guess I'll have to see how these taste in December to know for sure. Other than possibly decreasing the conditioning time, I cannot think of a needed change to this beer. I do have to be extra careful on the pour of this one so that the cherries in the bottom of the bottle don't get mixed in. I wonder if I might want to try to filter some of those out from the bottling bucket next year. I wonder if I'll remember that a year from now. I recently bottled Tommy Hawk APA. The taste test going into the bottle tells me that I added way too many flavoring hops. My intention was to recreate New Belgium Brewery's Mighty Arrow APA, but I certainly overdid the Amarillo and Cascade hops in the 20 minute boil range. Live and learn I guess (or should I say brew and learn?) I've already made changes to my recipe, but I'm not sure when I'll be able to fit this one into the schedule again.